Add a protective layer to surface of your home or building by providing excellent resistance from extreme weather and environment damages. The elastomeric coating proves to be strong waterproof barrier helps in prolong the life of building exteriors and roofs from leaks, holes, pealing, cracks and other damages which cause to expensive repairs. Tetra Construction Corp. offers Elastomeric Coatings Contracting services in Tri-State Area of New York, New Jersey and Connecticut. We are fully insured and certified with prestigious safety authority compliance all safety standards. We are your trusted partners of property managers, private lenders, homeowners, industrial and commercial buildings owners for years provide them cost effective elastomeric coating solutions. We ensure highest level of exterior renovation, repair and reinforce services at affordable price. Elastomeric wall coating helps you in bridging hairline cracks. We offer variety of elastomeric wall coatings including EIFS panels, block, brick, and pre-cast stone for best weatherproofing and water penetration. This proves to be extremely durable & resistant against cracks. Elastomeric coating and exterior paints are available in custom and standard colors giving you the opportunity to choose from wide range to enhance the curb appealing of your building. Give your appearance a new look with even tone finishes. 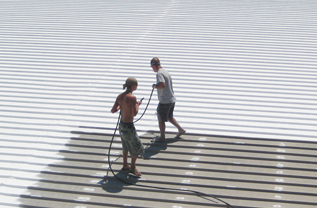 Elastomeric roof coating is the cost effective solution for roof weatherproofing. This prolongs the life of roof by preventing it from further damages like cracks, holes and leaking. When the building envelope system failed due to water infiltration elastomeric coatings proves to be the best alternative as compared to other waterproofing methods. Want to extend the life of your commercial or residential roof instead of replacing entire roof? Get advantage of elastomeric roofing coating and reinforce your roofing system. This is economical, flexible long lasting and easy to apply solution provide you exceptional protection and coverage. No matter what type of elastomeric coatings and exterior painting you required, we equipped with all the expertise, knowledge and equipments required to meet your expectation. Need elastomeric coatings job for residential, commercial or industrial building in Manhattan, Queens, the Bronx, Brooklyn or Staten Island? Don’t worry we cover New York City and surrounding areas. Give us a Call! get expert advice and consultation on your project. Estimates are free. What are you waiting? Let’s discuss now!